When Angeline arrived at Angel House she was very weak, couldn’t walk or support her own body weight and was blind. One eye had been removed, and the other eye was severely diseased due to malnutrition. To be honest, we were nervous. “How would we be able to care for her adequately? How will this work out? Could we do this?” But God has never presented us with a challenge without providing the solution. We took faith in this history and His promise. Right away, God showed us again that we can trust Him. He has used a special relationship with her nanny to show how He can and will provide. Once a child is brought to Angel House, they are immediately matched with a nanny so that child can feel safe and learn to attach to one person. 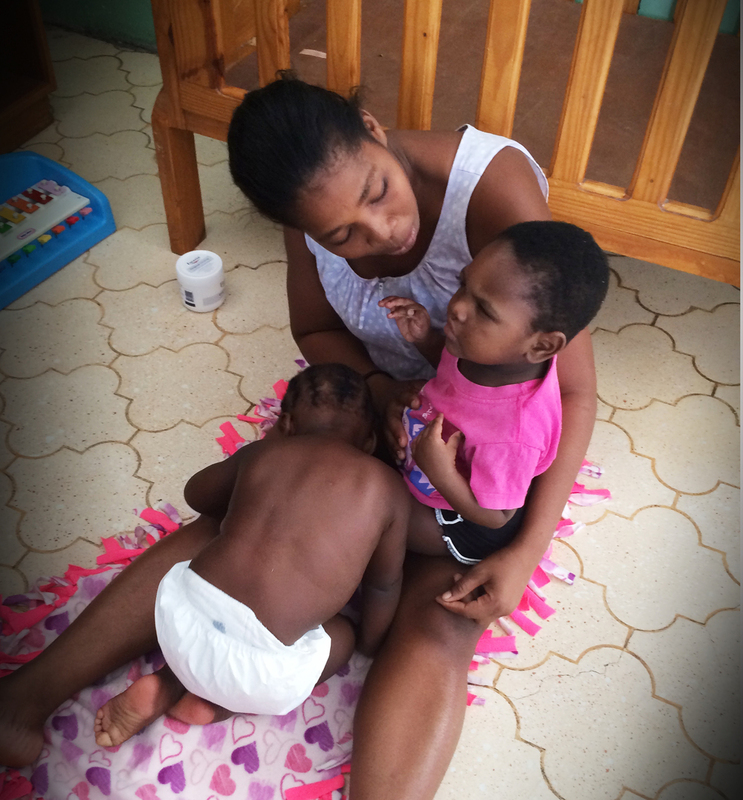 When Angeline arrived, two of our children had just gone home with their adoptive family. Naturally, she was placed with their nanny, Natacha. She is probably one of our more emotionally reserved staff members -- loving but quiet, firm in her demeanor yet soft spoken. We have known Natacha for over eight years as one of our most trusted employees. What we did not know about Natacha is that she had been the primary caretaker for her blind grandfather since she was a little girl. We didn’t discover this until after we matched her with Angeline. We soon noticed a marked change in Natacha’s demeanor. She was not afraid of caring for Angeline; in fact, she was quite confident. She was more engaging and animated than we had ever seen her before. It’s like she was showing a whole new side of her personality, and it was wonderful. We found out about Natacha’s grandfather, who had since passed away, a few weeks after Angeline arrived. She told of how she was the one to wash and dress him. She would help him with using the bathroom and with meals. When they would go anywhere he would always have his hand on her shoulder. He liked to sing and tell Natasha stories. He was not only her grandfather; he was her friend. When he died, she said she felt a great loss...until Angeline arrived. Angeline has thrived under Natacha’s experienced care. Her legs used to be so weak from being confined in a crib that they would shake if she tried to stand. 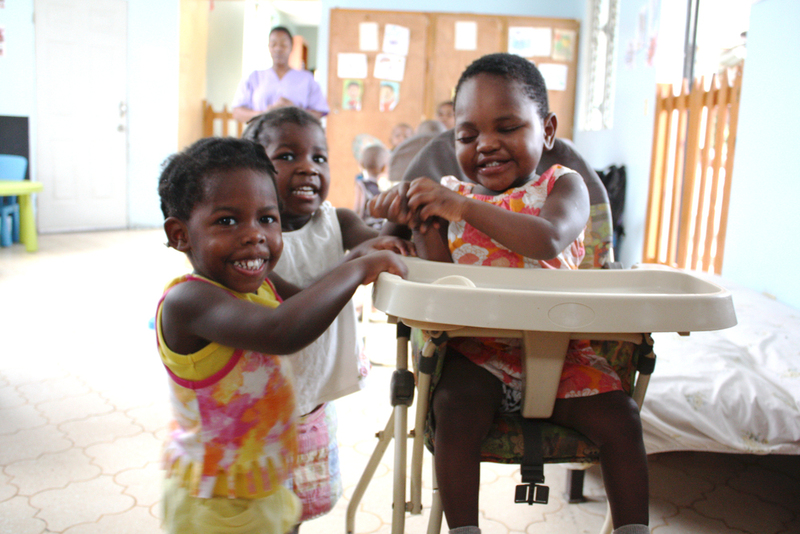 With Natasha giving her regular physical therapy, Angeline can now stand and is starting to walk with assistance. We trust she will be on her own before long. Her hair no longer has the red tint of malnourishment, and her health is on target. She had a procedure to support her ocular structure where the eye had been removed, and after a more thorough examination, it was determined that that she can see light and shadow in her other eye, that it is reactive. With another surgery when she is older, she may even be able to have limited vision! Angeline is truly a delight to everyone at Angel House. 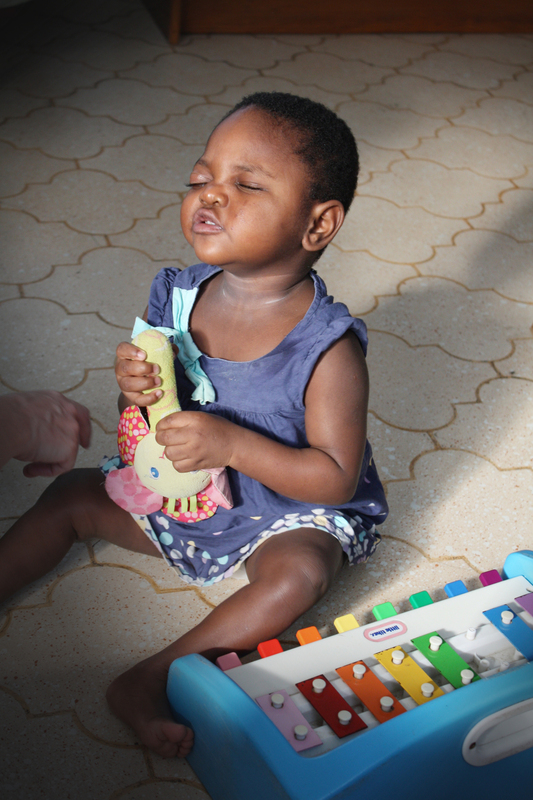 She gravitates towards musical toys and is often singing first thing in the morning and throughout the day. She is becoming more and more verbal -- asking for toys, forming sentences, requesting Natacha, etc. The other kids are not shy with her, and she has made friends. Samuel asks her to sing, and she gladly does. 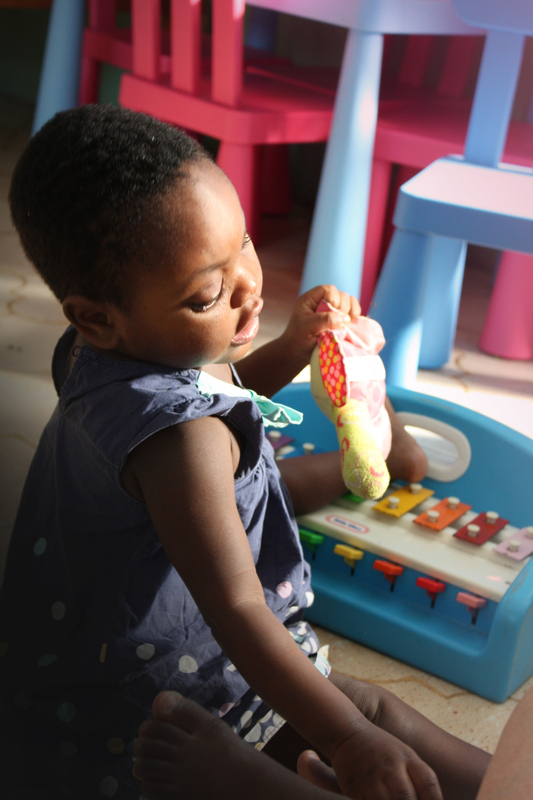 Tressilus will bring Angeline her favorite toys like her little piano. She is most comfortable around the other girls who are a little less rough and tumble, however. The other kids know that Angeline is special and are extra careful with her. And if they get a little too rambunctious, you can be certain Natasha is sure to step in. While Orphan Care Sponsors are essential to providing Angeline with quality care, what this little girl needs most is a family. Think for a moment about your family and the incredible impact they have had on your life -- the way they loved you, supported and cared for you when no one else was there. This is our prayer for Angeline. Most often, God answers prayers through people. Could you be that family for Angeline? This little girl is limitless, and she will bring some mom and dad immense joy. And if they love to sing, all the better!